Pete's Box is a custom sugar cookie stash inspired by Pete from Pete's Basement! The Pete's Box LVL 2 features long time comic book lovers, Pete's Basement hosts and friends, Pete and Ramon in the style of art by Rick Celis, recreated and handpainted by Hannah of 8 Bit Bakeshop. 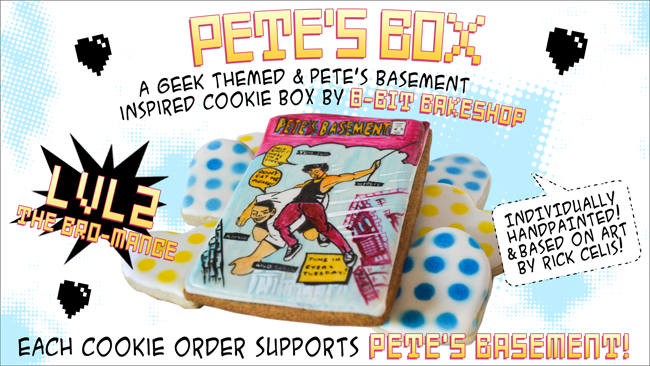 This special cookie box, and Pete's Box LVL 1, is available to you in all it's sweet geeky glory with profits from every sale going directly to supporting the Pete's Basement Comic Book Talk Show!